Testing for ovarian reserve is a term used to describe some basic tests which are helpful in determining a woman’s fertility potential. More specifically, circulating hormone levels are measured as useful markers of the efficiency of her ovaries and how likely she is to respond to IUI or IVF treatments. The tests also provide an assessment of the health of the eggs at the time the testing is performed. In other words, the test results provide the odds of producing healthy eggs during a treatment cycle. 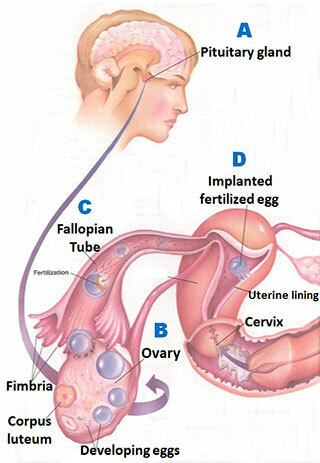 The image displays the intricate process of fertilization starting with the FSH and LH hormones in the pituitary gland. Hormones in the female are released from the pituitary gland and ovaries throughout the month. The pituitary hormones, FSH and LH, help control ovulation. The ovarian hormones, estrogen and progesterone, help prepare the cervix and uterus for conception. Ovulation occurs once a month. 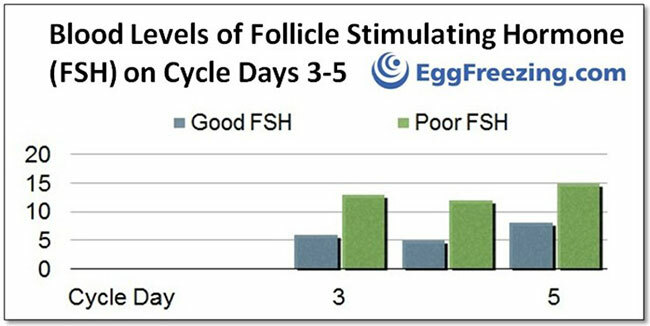 Eggs begin to mature in either ovary in response to FSH. Each egg develops a bubble-like follicle, which produces increased amounts of estrogen. The estrogen prepares the cervix and cervical mucus for the passage of sperm. It also helps trigger the surge of LH, which causes the mature egg to burst from the ovary. After ovulation, a corpus luteum is formed. Progesterone is ten produced and an elevated temperature may be recorded. Small, finger-like fimbria pick up the egg from the surface of the ovary. Fertilization occurs when one of hundreds of sperm penetrates the egg in the fallopian tube. The fertilized egg stays in the fallopian tube for up to 72 hours while fine muscular contractions propel it toward the uterus. A blood sample is obtained between the 3rd through the 5th day of your menstrual cycle and it can provide useful information about your ovarian reserve. For your convenience, we offer this test at West Coast Fertility Centers located in Orange County, Southern California. Our ovarian reserve panel consists of the following blood hormone levels: FSH, LH, Estradiol, TSH and Anti-Mullerian Hormone (AMH). You can calculate the correct day to undergo this testing by documenting the first full day of menstrual bleeding and contacting our center to schedule your tests: 714-513-1399. FSH (Follicle Stimulating Hormone): A woman’s pituitary gland releases FSH hormone to the ovaries triggering follicle recruitment which leads to the selection of the dominant egg in that cycle. Fluid-filled sacs called follicles contain the egg and send a chemical signal to the pituitary gland causing the FSH level to taper off and remain in the lower favorable range. Less robust ovaries and follicles respond weakly and the FSH climbs higher into the unfavorable range. There can be some variation in FSH levels from month to month but generally speaking, high levels of FSH indicate that your ovarian reserve is low and egg quality may be diminished. In humans, there is a normal physiologic rise in FSH levels with increasing age which can signal lower pregnancy rates. The graph above shows that blood levels of FSH on cycle days 3 through 5 can suggest reassuring or non-reassuring ovarian reserve. When FSH is elevated, it is useful to measure this hormone one or more times to document the trend in a woman’s level. Elevated levels of LH often suggest Polycystic Ovary Syndrome (PCOS) and can lead to several metabolic and ovulatory problems. The relationship of this hormone to your FSH level may indicate infrequent ovulation and irregular or absent menstrual periods. When estrogen levels are higher than expected, it suggests compromised ovarian reserve because a high E2 level suggests abnormally abrupt growth and will cause an unfavorable suppression in the FSH hormone. The TSH hormone is responsible for many metabolic functions including menstrual disorders and in certain cases repeated miscarriage. Low thyroid function can usually be treated by replacement therapy. The AMH hormone is produced by ovarian cells in close proximity to the eggs and the level detected in the blood is a useful adjunct to predict ovarian function, egg quality and even pregnancy rates. It can also help in designing the best medication protocol to use during an IVF cycle. In the case of this hormone (AMH), a higher production by the ovaries signals excellent ovarian function and robust egg quality. During the first several days of the menstrual cycle, it is possible to count the number of resting follicles in each ovary (AFC) and therefore utilized as an additional tool in helping select the best treatment for our patients. This test is performed painlessly and quickly by an ultrasound scan. The test can be performed in 10 minutes and results are available immediately. For more information about how to test your ovarian reserve, please contact our egg freezing patient coordinator at 714-513-1399.